The most difficult part of a cat eye is getting the wings at the same angle and length, so this is my #1 trick for the perfect winged liner. Each time you do it, the better you'll get, until you don't need the concealer guide anymore and you can free hand it! I like to use the either the felt tip pen or brush tip liquid eyeliner. I don't really like the "Too Faced" brand pen bc it isn't that transfer-resistant and will end up getting black on my top lid. My faves are either the "Stila" or "Kat Von D" brand. The Stila has a felt tip and the Kat Von D has a brush tip, that I like a little bit more, because I feel like the tip stays sharper longer. 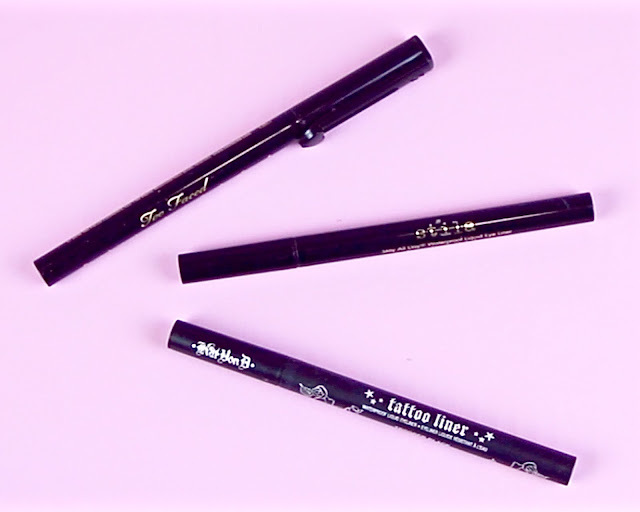 With these pen types, you can go over and over without it getting cakey and flaking, they're highly pigmented, they glide across your lids in smooth strokes, they lasts all day and you have control over the pen. I always use black when I'm doing wings, so make sure you're not getting a brown or a gray. My #1 trick to guide your wings is to use a small concealer brush to paint on guidelines before you go in with black! 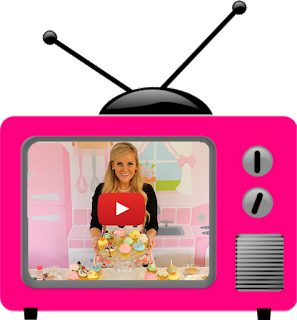 This technique is similar to what I do when I an piping decorations on a cake- Ill mark it out with a using the same color frosting, so I have an invisible guide for a perfect end product. Another trick is to make sure you position your mirror in front of you and slightly underneath you so you can look down, so your lid is flat and you don’t have any creases getting in the way. I don’t do this trick as much anymore, now that I know how angled and how long I like my wings, but it’s really helpful if you’re starting out, to get the hang of it. I have pretty round eyes, so I love to use this technique to create the illusion of a lifted, more almond shape eye. Some days you are going to get them both perfect in one swoop and sometimes not so much... just take your time, the more steady and smooth each stroke is, the nicer it turns out. When you are nervous and pressing hard, like when I’m in a rush, I always end up messing up and it takes me longer because I have to re-do it. But practice definitely helps, so each time you do it, the better you'll get, until you don't need the concealer guide anymore and you can free hand it! 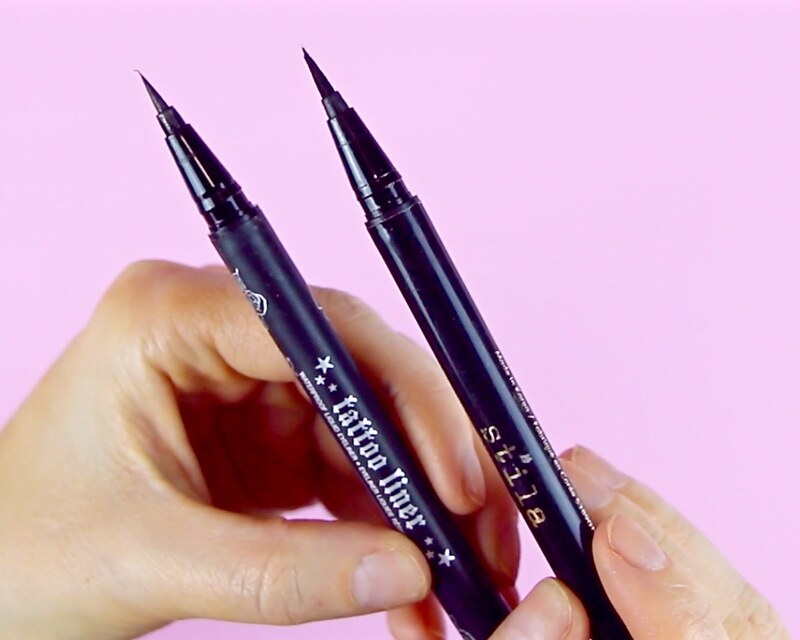 Paint on a line of conceal with a small brush upward from the lower lash line to the end of the brow, stopping about half way, this way you can erase and re-do as many times and give yourself a perfect guide, so you don’t mess up all your makeup by trying to do it with black the first go around. Next, line your eyes by making a thin line as close to your lashes as possible, getting as thinner as you get towards the inner corner of your eye and thicker towards the outer corner. Now, we add the wings by tracing along your concealer guide, starting at the corner of your eye, working your way outward and upward, lightening the pressure as you go up so it gets thinned towards the end. Then, connect the top of the wing, back down into the already lined eye, in a triangle shape. Last, clean it up with the little concealer brush to really sharpen the wing and blend any concealer right into your skin. For the finishing touches, I add a little black pencil liner to my water line on bottom and tight line on top, and some lashes to really make your eyes pop and pull the look together.